Free, 3x3-hour, in-store, classes with purchase of each Bernina machine taught by certified a Bernina Instructor. Ask your in-store associate for details. All in-store repairs done by certified technicians. Imagine a machine that automatically responds to your needs. The presser foot automatically lowers at the start of a seam and lifts again at the end. The B880E will even cut the thread for you at the end of a seam or color change in embroidery. The feed dog raises and lowers automatically for free-motion stitching and embroidery. And of course, fully automatic threading is yours at the touch of a button. The B 880E includes a meticulously engineered extended freearm area with a full 12 inches of space to the right of the needle and five inches in height. With this extralarge area, you’ll have the added benefit of a jumbo embroidery field, an extended space to expand your creativity. The BERNINA 880E includes a library of over 1,764 stitches, conveniently stored by category for a wide variety of applications. You’ll find the perfect stitch for every sewing project. Over 400 high-quality embroidery designs, including motifs by well-known designers, and 12 font styles are perfect for personalizing your projects. The seven-inch touchscreen on the BERNINA 880E offers high-resolution images and brilliant colors. Cutting-edge touchscreen technology lets you choose from a wealth of innovative functions. The BERNINA 880 offers drag and drop, vertical scrolling and the swipe function for deleting motifs easily. It also features a highly intuitive onscreen operating concept providing numerous personalized settings. 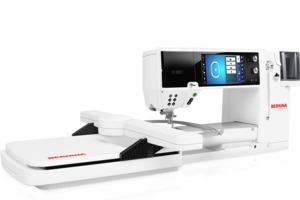 The BERNINA 880E offers hundreds of stitches that are clearly categorized and easily retrieved. With the innovative Stitch Designer you can edit these or create your own stitches. Simply draw your ideas directly on the screen. The BERNINA 880 converts the design with a click into a stitch pattern. You can also change and save existing stitches. The possibilities are endless and your stitch library is continually expanding. BERNINA 880: how to sew with the BERNINA Dual Feed (BDF). This tutorial explains the functionality of the patented BERNINA Dual Transport of your BERNINA 880. This technology, which simultaneously feeds through layers of fabric from above and below, means that even difficult materials can be handled easily and accurately. The risk of the fabric slipping during sewing is as good as eliminated and even thick layers of material which is normally prone to gliding can be sewn perfectly with your BERNINA 880. Our video clearly demonstrates how to activate the Dual Transport, how to regulate feed quantities and presser foot pressure, how to work on your sewing piece and how to deactivate the Dual Transport again after use. Particularly practical: the "D" in the presser foot designation tells you whether a presser foot is suitable for the Dual Transport. BERNINA 880: how to sew and quilt with the BERNINA Stitch Regulator (BSR). In this instructional video you learn how to free-motion sew and quilt with the BERNINA Stitch Regulator (BSR). Thanks to the BSR foot, the sewing speed adapts flexibly to the movement of the fabric when sewing with the dropped feed dog. Thus the stitch length is regulated automatically and the stitches remain quite regular and the same length, regardless of how fast or slow you feed in the fabric. You can sew straight or zigzag stitches with the BSR foot. You can conveniently configure the desired stitches on the display of your BERNINA 880. You also have the option of starting sewing by pressing the button or using the presser foot. There are two different modes available. Either the needle moves permanently, whereby the stitch is automatically regulated and thus remains even, or the needle only moves when the fabric is also moving and stops a few seconds after the fabric stops moving. The second option is particularly recommended if you are not yet familiar with the system. So free-motion sewing and quilting with your BERNINA 880 is a pleasure from the start. BERNINA Ambassador, Cherry Guidry, demonstrates an easy way to do “hand embroidery” by machine! Find more fun tutorials on BERNINA's WeAllSew blog.